GOKPOP | Exclusive K-News in Malaysia & Singapore: New Journey To The West 5 Welcomes Block B's P.O + New Concept "Along With The Ghosts"
New Journey To The West 5 Welcomes Block B's P.O + New Concept "Along With The Ghosts"
Renowned Korean variety show Producing Director Na Young-Seok (Na PD) is finally back with his popular series New Journey To The West, which will premiere exclusively on tvN in Asia on 6 October (Every Saturday) at 21:00 (GMT+8). Returning with a fifth season, the show’s original members Kang Ho-dong, Lee Soo-geun, Eun Ji-won, Ahn Jae-hyun and Song Min-ho (MINO), welcomes new member, the rising star in variety shows – P.O from boy group Block B. The six of them altogether radiate happy vibes and strive to make audience roll on the floor laughing! The show has already gained public attention since the release of a teaser, which highlighted the zest of this season within a few minutes, “Na Young-Seok production team, which only specializes in cooking and travelling, has returned with his most notorious series after a year’s break. Unlike his other master pieces such as Youn’s Kitchen and Little Cabin in the Woods, the program has no host with outstanding foreign language skills but members who are illiterate with google translate; in extremely low resolutions with questionable camera angles; and provides contents that are way below audience’s expectation.” This hilarious narration underlines the charms that can only be found in New Journey to the West series, creating even more anticipation to the show’s premiere! In previous seasons, the show borrowed elements from classic Chinese novel Journey to the West and Japanese anime Dragon Ball to develop members’ characters and storylines. 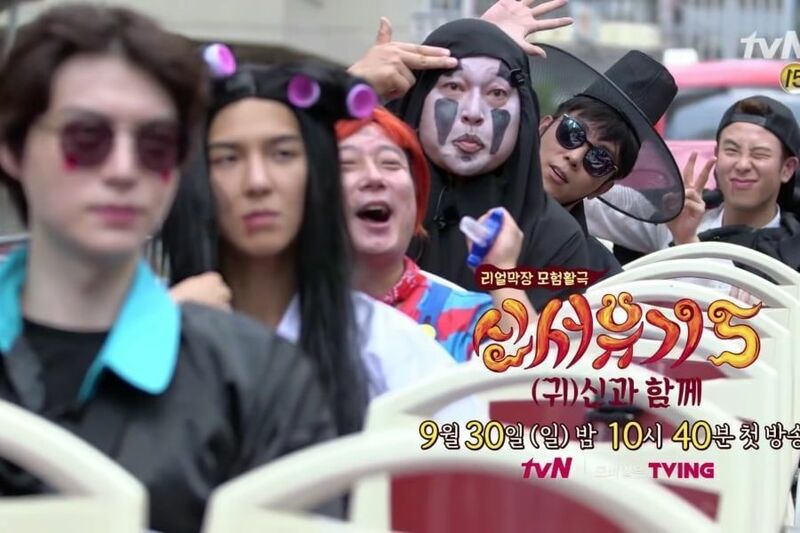 This time the production team plays around with the Korean blockbuster Along With The Gods by giving the show a subheading Along With The “Ghosts”, creating a whole new concept of amazing characters for the members. In the teaser, Kang Ho-dong dresses as No-Face a.k.a. 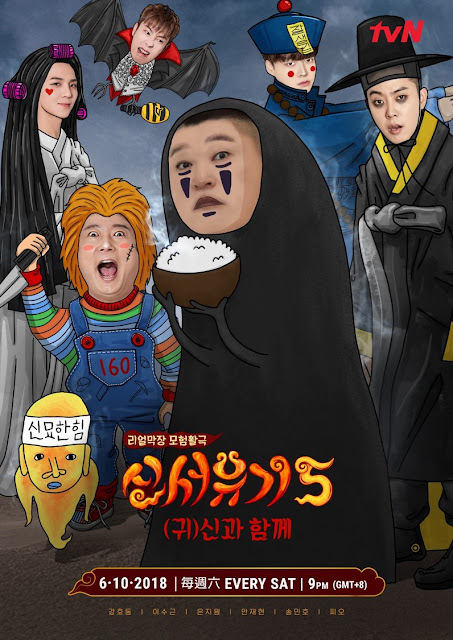 Kaonashi from Spirited Away; Lee Soo-geun plays Chucky from Child’s Play slasher film series; Eun Ji-won as a Grim Reaper with serious dark circles under his eyes; Ahn Jae-hyun dresses up as a Chinese zombie; MINO portrays Sadako from popular Japanese horror movie The Ring with added hair rollers to “beautify” his look; and P.O rocks Dracula’s costume. All members not just simply deliver an eye-catching image with their hilarious outfits, but also make the audience curious about the roles of each character and their chemistry in between. With new shooting locations, Hong Kong and Hokkaido, new costumes, more surprises and laughter, the premiere to go along with the ghosts is not to be missed! New Journey To The West 5 will broadcast on tvN in Asia from 6 Oct (Every Saturday) at 21: 00 (GMT+8). tvN is available in Hong Kong, Singapore, Taiwan, Malaysia, Indonesia, the Philippines, Thailand, Myanmar and Sri Lanka. The show is paired with English, Chinese, Bahasa Malaysia and Bahasa Indonesia subtitles.